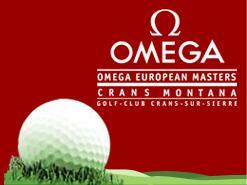 Omega watches became involved with the European Masters in 2001, when their financial support helped to make the tournament even more successful. The first Swiss Open was held in 1923, and at that time there were only 11 Golf courses in all of Switzerland. The oldest course was the Engadine-Samedan, which was built in 1898; this is where the first games were played. All the tournaments took place there, until 1939, when the Masters was moved to the Crans-sur-Sierre, where the French golfer Fifi Cavala took home the trophy. Omega is a proud sponsor of the European Masters Golf Tournament, and hopes to see this tradition live on for another 100 years. Omega certainly has shown their strive for excellence in the watchmaking world, and in keeping with that undying dedication, they continue to attract Ambassador’s with that same work ethic. Their fans include award winning actors Nicole Kidman and George Clooney, and 007 super spy James Bond. It only stands to reason that the world’s fastest swimmer would join that illustrious group. Michael Phelps, who at the age of 16 became the youngest ever to set a world record for swimming, has been an Omega Ambassador since 2004. Michael went on to greater achievements, and in 2008 at the Beijing Olympic Games he took home, an astounding 8 gold medals. Michael didn’t just jump in the pool one day and come out a champion…he trained for years, dedicated his time and energy, and demonstrated extreme determination. Omega, a watchmaker that has built a solid name for themselves shares those qualities. 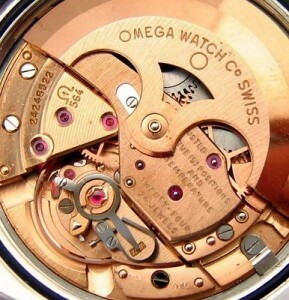 They have been producing fine Swiss watches for decades. Their innovation has opened doors to space and taken them to the depths of the sea floor. Keeping your cool and not getting rattled under extreme pressure is an intricate part of being a successful competitor. 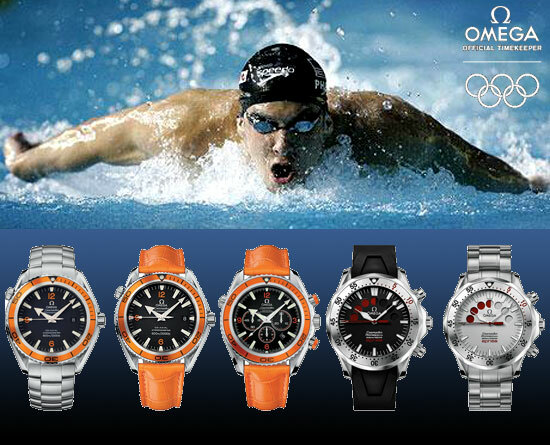 Michael Phelps knows this and that is why he chooses the Seamaster Planet Ocean from Omega. 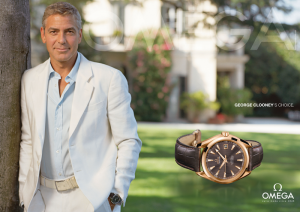 The Planet Ocean is a marvelous watch by Omega. Stylish and functional, the Seamaster is a true Omega classic, and talk about performing under pressure…The Planet Ocean can withstand depths of 2000 feet! Great choice Michael. March 3, 2010 – Omega Auckland Racing Regatta opens with strong tides and shifting winds at Waitemata Harbour in New Zealand. The competing teams are comprised of some of the best sailors in the world. Bean Ainslie of Great Britain topped the first day with a 6-2 score. Dean Barker and Adam Minoprio both of New Zealand and Betrand Pace of France tied 5-3. Some of the biggest names in the sport are competing, the skippers are: Dean Barker, Emirates Team, Chris Dickson, former BMW ORACLE Racing, and Adam Minoprio, BlackMatch Racing all three from New Zealand; Ben Ainslie of Great Britain, Team Origin; Francesco Bruni of Italy, Azzurra Sailing Team; Sebastian Col, former Areva Challenge and Bertrand Pac, former BMW ORACLE Racing both from France; Karol Jablonski of Poland, former Desafio Espanol; Magnus Holmberg of Sweden, former Victory Challenge; and Torvar Mirsky of Australia, Mirsky Racing Team. Under the auspices of the Royal New Zealand Yacht Squadron racing takes place in identical Farr-designed MRX yachts. Double round robin, semi-final and final take place, weather permitting, the semi-finals and finals are decided by the first skipper to win three matches. President of Omega Stephen Urquhart said there has always been a strong link between sailing and timekeeping, Omega is the only company to have produced a wristwatch that has chronometer certification. Sailors rely on high-precision marine chronometers for navigation. February 22, 2010 – Fairmont Hotel Vancouver. Omega honored two Olympic gold medalists the Swiss ski jumper Simon Ammann who won 2 gold medals and Maelle Ricker who won the gold in snowboard cross and right in her own backyard. Ricker is the fist Canadian woman to win a gold medal on Canadian soil. Presented with Omega Seamaster Planet Ocean watches by two legendary astronauts was just as exciting for the winners. Captain Gene Cernan and General Thomas Stafford accompanied by Omega president Stephen Urquhart did the honors. Cernan told Ammann he and Stafford had never worn gold medals and asked if they could try them on. Ammann complied laughing and handed one to each astronaut, one being the last human being to leave a footprint on the moon and the other commander of the Apollo Soyuz Test Project. They all posed for pictures in Omega’s bobsleigh in front of the Omega Countdown Clock. Pleased with her Omega watch and proud of her win for Canada Ricker said she will no longer be late for upcoming snowboard world cups. Ammann stated she was happy to meet other athletes like Ricker, knowing she grew up in Vancouver and how significant this was for her. Being Swiss Ammann was honored to be recognized by Omega for her excellent efforts and accomplishments. Omega is the official Timekeeper of the Vancouver 2010 Olympic Winter Games. February 22, 2010 – It was an exciting day for France when Biathlete Vincent Jay won a gold metal in the 10km sprint and then the French took another gold metal just a few hours later when Nordic skier Jason Lamy-Chappuis won the 10km individual normal hill event. Omega, as Official Timekeepers of the 2010 Vancouver Winter Games honored their magnificent performances with a presentation of the Seamaster Planet Ocean watch to each of them at a ceremony on February 23rd in Whistler at the timekeeper’s bobsleigh. Omega’s VP and International Sales Director Raynald Aeschlimann presented the watches to the winners recognizing their hard work and determination which made them the great Olympians they are. Omega is delighted to share the gift of time with them for their achievements. Vincent Jay also won a bronze in the 12.5 km sprint event in addition to his gold metal. By only four tenths of a second over American Johnny Spillane the Frenchman won the gold, the closest recorded time in Olympic Nordic combined history. Extending it’s partnership with the International Olympic Committee through 2020, Omega is the Official Timekeeper of the 2010 Vancouver Winter Games and has been for 24 years since 1932. February 27, 2010 – Omega welcomed Apolo Anton Ohno as its newest ambassador after he made history with his incredible performances at the games. Speed skating star Ohno, the most decorated U.S. Winter Olympian of all time was presented with an Omega Seamaster Planet Ocean Olympic Timeless Collection Chronograph watch. He said that Omega has been instrumental in his particular sport and his career. Following in the footsteps of other gold metal winners like Michael Phelps, Natalie Coughlin and Katie Hoff, Omega’s newest ambassador Ohno is the only one to be chosen this year. Omega has been the Olympic Timekeeper of the 2010 winter games and has been instrumental in technological advancements in all sports-related timekeeping which include new technologies for speed skating, Ohno’s forte. Ohno won three short track metals in Vancouver, a silver in men’s 1500mm, a bronze in the 1000m and a bronze in the men’s 5000m relay, with eight career Olympic metals this young man has surpassed Bonnie Blair’s status of being the most decorated U.S. Winter Olympian. Presented with Omega’s commemorative set of Olympic pins representing each of the 24 Olympic Games, Ohno signed the Omega Boutique’s guestbook at which the company served as Official Timekeeper. February 21, 2010 – As a special guest at a cocktail party given by Omega, Britain’s first individual Olympic Winter Games gold medalist in thirty years Amy Williams was honored. Ms. Williams was presented with an Omega Seamaster Planet Ocean wristwatch by none other than the famous astronaut Buzz Aldrin. Made famous for landing on the moon in 1969 with Neil Armstrong, Dr. Aldrin is an Omega ambassador. Last Friday Ms. William’s run at Whistler Sliding Centre was only the ninth gold metal that Great Britain has ever won and she was recorded as being the fasted ever on that track. Ms. Williams hit speeds of 90 mph during her 53.83 second run on Arthur, as she affectionately refers to her sled. Amy Williams declared her gratitude at being acknowledged by Omega and receiving her award from the second man to walk on the moon which made it all the more significant to her. She acknowledged Omega’s commitment to the Olympics. Amy’s dedication to the sport was mentioned by Dr. Aldrin; he said admired her sacrifice and determination.